The Breeders’ Cup Juvenile (Grade I) runner-up and third-place finishers Knicks Go and Signalman are among a promising and ultra-competitive cast of 14 2-year-olds that were entered for Saturday’s 92nd running of the $200,000 Kentucky Jockey Club (GII) at Churchill Downs. The Kentucky Jockey Club – a “Prep Season” race on the “Road to the Kentucky Derby” in which the Top 4 finishers will receive 10-4-2-1 points, respectively – goes as Race 11 at 5:56 p.m. (all times Eastern). First post is 1 p.m. The co-featured $200,000 Golden Rod (GII) for fillies is Race 9 at 4:57 p.m.
One of Colebrook’s targets for Knicks Go was the Dec. 4 Marylander at Laurel Park but the 40-year-old conditioner opted to enter the colt in Saturday’s race. Jockey Albin Jimenez has the return call and will break from post position No. 13. Chief among Knicks Go’s competitors in the Jockey Club is Breeders’ Cup Juvenile third-place finisher Signalman for owners Tommie Lewis, David Bernsen and Magdalena Racing and trainer Kenny McPeek. Signalman finished one length behind Knicks Go in the Juvenile after breaking from post 14 and rallying from 10 lengths off the early pace. The Breeders’ Cup Juvenile was not the first time Signalman trailed Knicks Go; the son of General Quarters was the runner-up in the Breeders’ Futurity. Hernandez has the call in the Jockey Club and will break from the rail. Also among the main challengers in the Jockey Club is Joseph Besecker and Three Diamonds Farm’s undefeated Dunph. The gelding by Temple City stormed to a 7 ¾-length win in the $300,000 Spendthrift Juvenile Stallion Stakes on Oct. 28 at Churchill Downs. 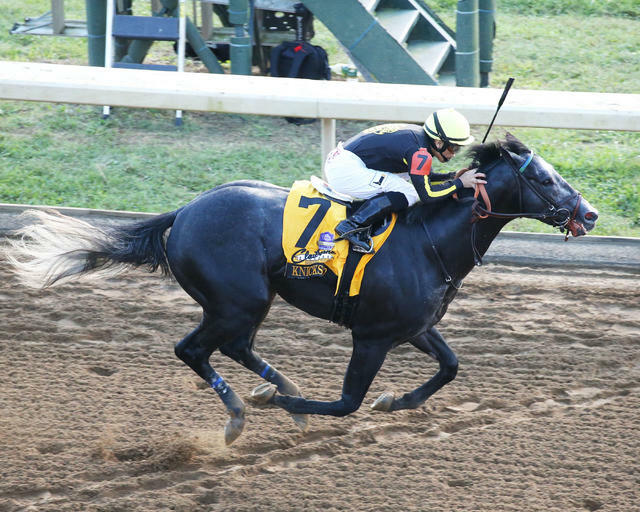 Trained by Mike Maker, Dunph was privately purchased by Kirk Wycoff’s Three Diamonds Farm following his 8 ½-length maiden-breaking score in September at Penn National. Dunph will break from post 4 with Tyler Gaffalione in the saddle. Also entered in the Jockey Club is impressive maiden winner King for a Day and Bourbon (GIII) stakes winner Current for trainer Todd Pletcher, who won the race in 2009 with eventual Kentucky Derby winner Super Saver. King for a Day, who drew post 12 with Hall of Fame rider John Velazquez up, defeated seven rivals on Oct. 4 at Belmont Park by 2 ¼ lengths. The bay colt by Uncle Mo is owned by Stephen Brunetti’s Red Oak Stable. Current, a chestnut-son by Curlin, is attempting dirt for the first time following a most-recent seventh-place effort in the Breeders’ Cup Juvenile Turf (GI). Current, owned by Robert LaPenta, Eclipse Thoroughbred Partners and Dixiana Farms, will be ridden by Javier Castellano from post 9. The complete field for the Kentucky Jockey Club from the rail out (with jockey and trainer): Signalman (Hernandez, McPeek); Tracksmith (Adam Beschizza, Joe Sharp); Manny Wah (Channing Hill, Wayne Catalano); Dunph (Gaffalione, Maker); Plus Que Parfait (Julien Leparoux, Brendan Walsh); Blue Steel (Robby Albarado, Dale Romans); Limonite (Ricardo Santana Jr., Steve Asmussen); Royal Urn (Leonel Reyes, Michelle Nihei); Current (Castellano, Pletcher); Roiland (Edgar Morales, Tom Amoss); Mick’s Star (Corey Lanerie, Amoss); King for a Day (Velazquez, Pletcher); Knicks Go (Jiminez, Colebrook); Topper T (Florent Geroux, Bill Mott). Also Eligible should any early scratches occur: Everfast (Albarado, Romans); and Kentucky Allstar (Santana, Maker). Saturday’s National Weather Service forecast for Louisville calls for a high temperature near 58 with rain showers ending before 8 a.m.